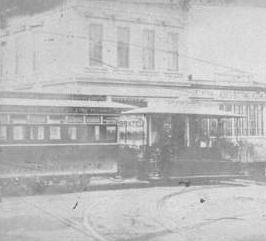 Sutter Street Railway train near Powell, before 1906. Temple Emanu El in the background is now the site of the 450 Sutter Medical Building. (source: [group 32:290], Roy D. Graves Pictorial Collection, ca. 1850-ca. 1968, BANC PIC 1905.17500--ALB, The Bancroft Library, University of California, Berkeley). Mar, 1998 Picture of the Month. extended: Oct 1879. Sutter Street to Central (now Presidio) Avenue. powerhouse: Sutter & Central. Early wire ropes were too short to cover the whole main line after extension. powerhouse: Sutter & Polk. Replaced both earlier powerhouses in 1883.
cars: double-ended dummy & trailer trains. turntables: double turntables at Central Avenue. Used to switch cars from track to track, not to turn them. Cross overs at Market/Sansome. opened: late 1878. Larkin Street from Sutter to Hayes. The first crosstown line. extended: 1887. 9th Street from Mission to Brannan. extended: 1888. Polk Street to Pacific Avenue, Pacific Avenue to Fillmore. extended: 1891. Pacific Avenue from Fillmore to Divisadero. cut back: 1906. Pacific Avenue from Polk to Divisadero. powerhouse: Sutter & Polk. See main line. powerhouse: After 1906. Pacific between Polk & Van Ness. See notes. notes: The Sutter Street Railway was the second cable car line built in San Francisco. This line did not climb any significant hills; it proved that cable traction did not have to limited to hills. It connected the residential Western Addition with downtown. 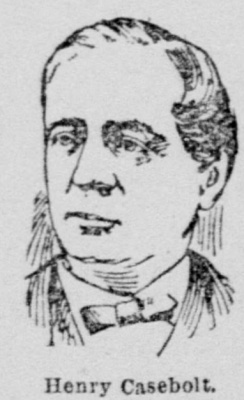 Henry Casebolt (Source: San Francisco Morning Call, Saturday, September 24, 1892). 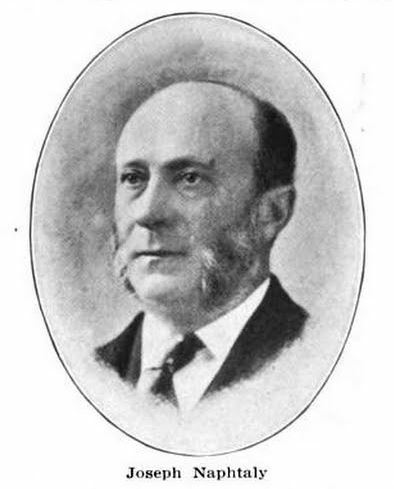 Asa Hovey (Source: Street Railway Journal, May, 1895). The line was promoted by Henry Casebolt, a prominent machine works owner. Engineer Asa Hovey and Casebolt designed the cable line. It replaced a financially unsuccessful horse-operated railway and helped to demonstrate that cable traction could be more economical than horse power. It was the first line to use a side grip, which became the most common kind of grip in the cable traction industry. Casebolt sold his interest in the line on 28-Jan-1880. 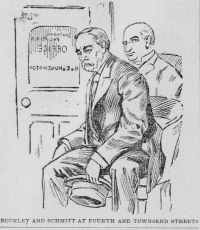 Political boss Blind Chris Buckley and his henchman Maurice Schmitt call on Southern Pacific headquarters. (source: San Francisco Call, 26-October-1894). New owner real estate dealer Robert F Morrow and his associates, the Schmitt brothers and their brother-in-law, Joseph L Schmitt, Charles A Schmitt, Maurice Schmitt and Joseph Naphtaly, started making changes to the line, including consolidating operations in a single new powerhouse and rebuilding the conduit. The company ran a connecting horse car line from Polk and Pacific to Polk and Union. 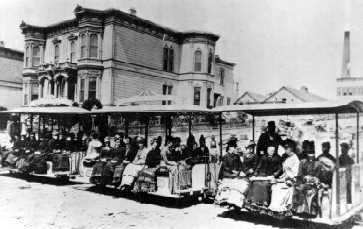 The company and its successors continued to operate a horse car line from the Market/Sansome/Sutter terminus to the Ferry Building. Never converted because of franchise conflicts, this was the last horse car line to operate in San Francisco (last run: 03-Jun-1913). The car was a former cable trailer. Read an 04-June-1913 newspaper article about the last horse car to run in San Francisco in regular service. 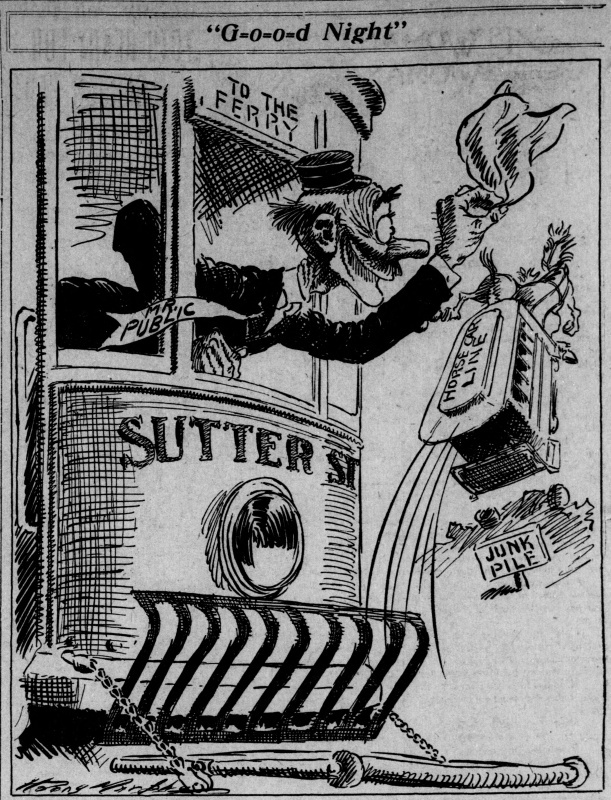 In an editorial cartoon from the 04-June-1913 San Francisco Call, Mr Public apparently operates a Sutter Street electric car to the Ferry and bids G-o-o-d Night to the horse car as it makes its way to the junk pile. June, 2013 Picture of the Month. 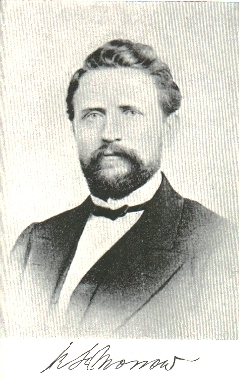 The company's carmen engaged in a major strike in 1886-1887. The superintendant organized a gang of plug-uglies and engaged in a shooting spree. One grip car was blown up with dynamite. 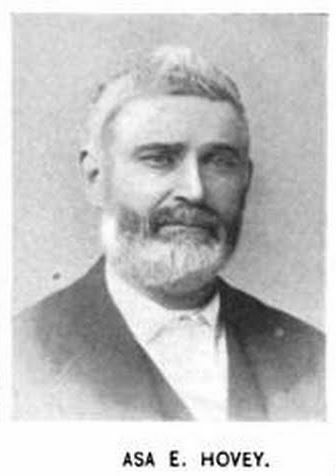 Adolph Sutro, who owned most of western San Francisco, fought with the management of the Market Street Railway, which insisted on charging two fares for people to reach his Cliff House, Sutro Heights, and Sutro Baths. Sutro opened the electric Sutro Railroad, which connected with the Sutter Street line at Sutter & Presidio, and went out Euclid, Clement, 33rd Avenue, and Geary, to a terminal at what is now Merrie Way above Sutro Baths on 01-Feb-1896. The Sutter Street Railway purchased the Sutro Railroad before 1902. The Sutter Street company was taken over by the United Railroads of San Francisco in 1902. The earthquake and fire of 18-Apr-1906 destroyed the powerhouse and ruined the lines. The main line and most of the Larkin Street line were converted to electric traction. 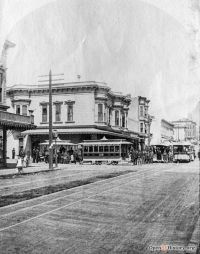 Pacific Avenue from Polk to Divisadero was restored as a cable car line, because rich neighbors did not like trolley wires. 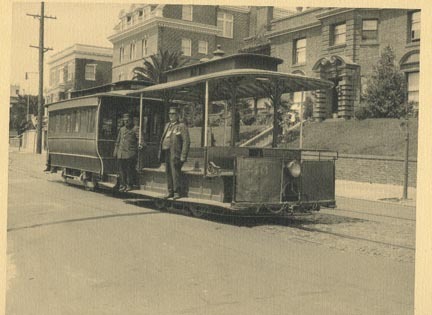 Even though Charles Smallwood's The White Front Cars of San Francisco, which is regarded as canonical in many quarters, says that the cable was powered by an electric streetcar motor, we have learned that even Charles Smallwood could make a mistake. Thanks to Emiliano Echeverria, we now know that URR moved the electric motor and winding machinery from the Hayes Street powerhouse and used it for the Pacific Avenue line. In 1915, URR took grip car 55 and made it enclosed with a sliding gate on each side, so that it could be operated by one man. Taking fares, giving out change and transfers and working the grip and brakes proved to be too much for one man. The experiment is said to have lasted only a few days. 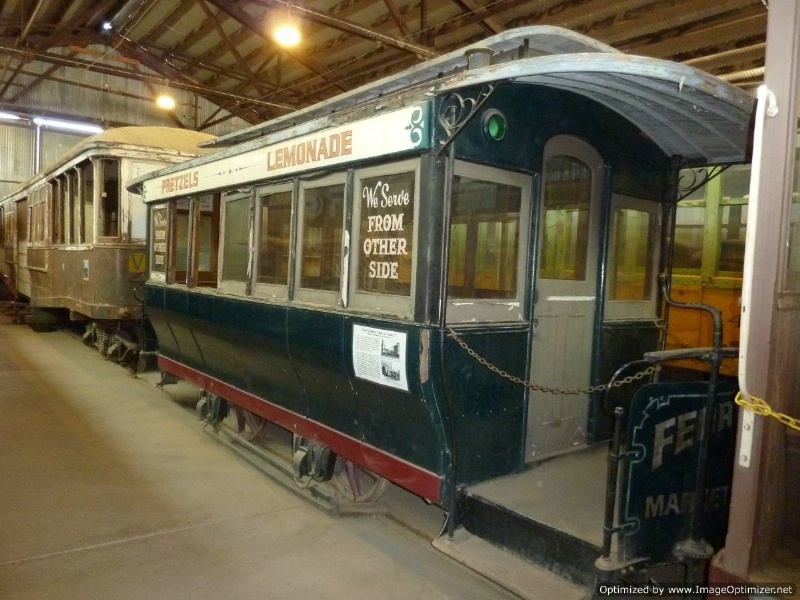 One train (grip 46, trailer 54), restored for the Cavalcade of the Golden West at the 1939 Golden Gate International Exposition on Treasure Island, is on display at the Cable Car Museum in SF. Trailer 77 is preserved at the Orange Empire Railway Museum in Perris, CA. The trailer had once been displayed at Knott's Berry Farm. It was regauged at some point to 3'6". Sutter Street Railway trailer 77 was used as a snack stand at Knott's Berry Farm. Bob Murphy took this photo at the Orange Empire Railway Museum. All rights reserved. The main character of Frank Norris's novel McTeague lived near the Sutter Street powerhouse. Many of his dental customers were Sutter Street employees. 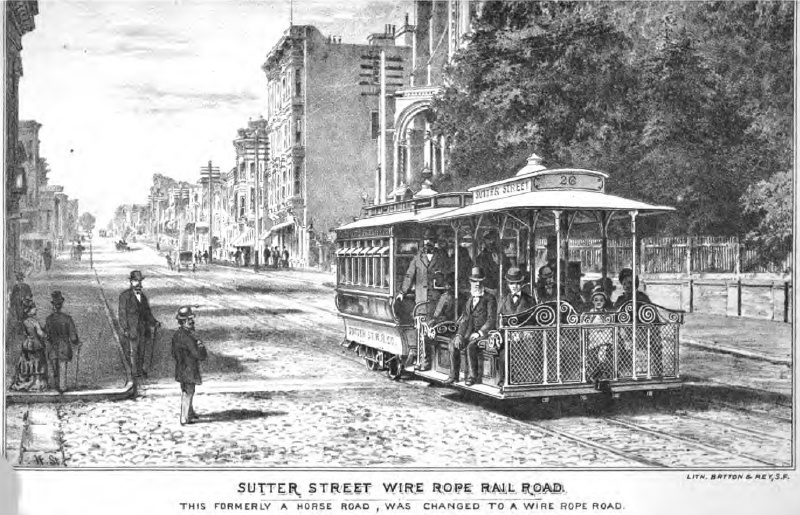 Read more about the history of the Sutter Street Railway in "The Sutter Street Railway - San Francisco's Second Cable Car Line" by Walter Rice and Emiliano Echeverria. Read about the Sutter Street Railway's connecting steam dummy service in "When Steam Ran on The Streets of San Francisco, Part I," by Walter Rice and Emiliano Echeverria. Casebolt also promoted an unusual overhead cable line across the bay in Emeryville. 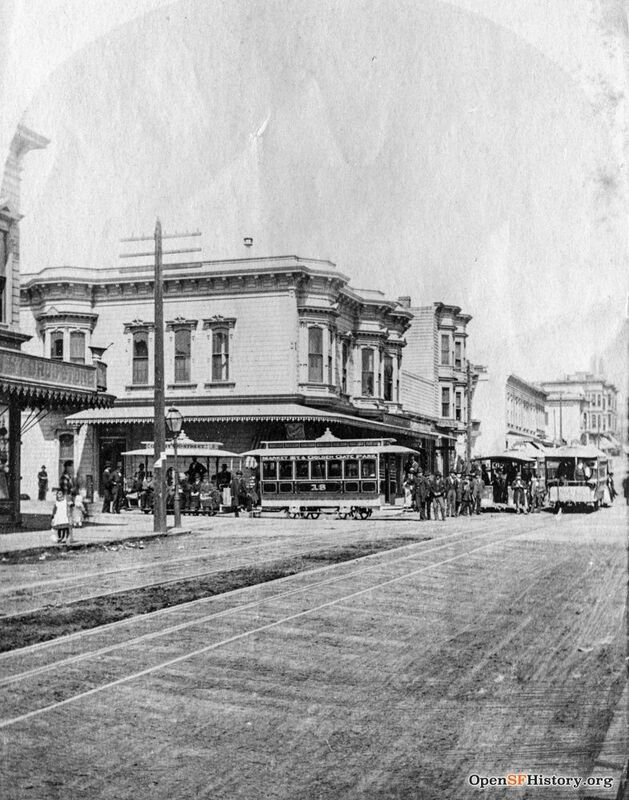 Photograph of the intersection of Powell & Sutter Streets before 1906. Two Sutter Street trains cross Powell in the foreground. A Powell Street car descends the hill from Bush towards Sutter (Source: "Cable Car Days in San Francisco", Edgar M. Kahn, 1944). Jul, 1997 Picture of the Month. 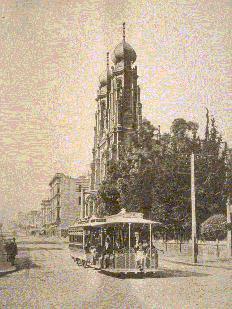 An early shopper's shuttle on Sutter Street. Note the passengers. The only known example of a San Francisco cable car pulling two trailers. 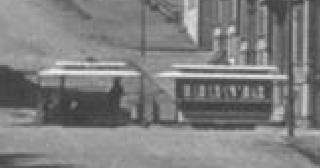 Poor quality close-up image from a stereoptican slide of a Sutter Street Train, possibly at Central (now Presidio) Avenue (Source: [group 44:15355], Zelda Mackay Collection of Stereographic Views, BANC PIC 1905.14906-.16118 -- STER, The Bancroft Library, University of California, Berkeley). The "Sutter Street Wire Rope Rail Road" in this woodcut from "The Cable Railway Company's System of Traction Railways for Cities and Towns". September, 2008 Picture of the Month. Former Sutter Street Railway train on Pacific Avenue in the 1920s. November, 2004 Picture of the Month. 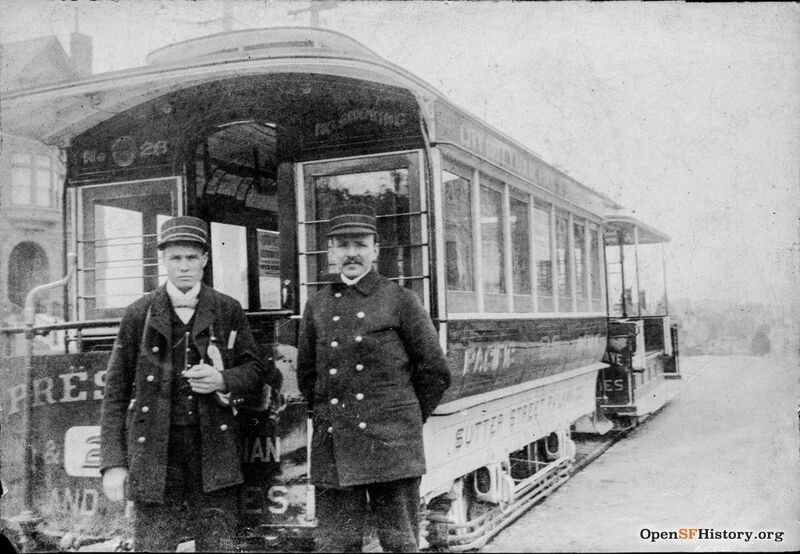 A conductor and a gripman pose with a Sutter Street Railway train. I like the angle. (Source: OpenSFHistory / wnp27.4669.jpg). March, 2018 Picture of the Month. The first crossing between two Hallidie-type cable car lines, at Geary and Larkin Streets. A Geary Street Park and Ocean Railway train is on the left. Two trains of the Sutter Street Railway's Larkin Street line are on the tracks running towards the camera. The Larkin Street line was superior (did not have to drop the rope) because it was there first. (Source: OpenSFHistory / wnp27.02535.jpg). April, 2018 Picture of the Month. Sutter Street Railway's first powerhouse at Larkin and Bush. It is labelled "Formerly Sutter St. Cable HQ". Bush is at the left and Larkin is at the bottom (Source: Sanborn Fire Insurance Maps, San Francisco, 1886, Vol 2, Sheet 48b). Site of Sutter Street Railway's short-lived outer powerhouse at Sutter and Central. Later used as a car house. Sutter is at the right and Central is at the top (Source: Sanborn Fire Insurance Maps, San Francisco, 1899, Vol 4, Sheet 394). Sutter Street Railway's main powerhouse at Sutter and Polk. Sutter is at the right and Polk is at the top (Source: Sanborn Fire Insurance Maps, San Francisco, 1899, Vol 1, Sheet 101). Sutter Street R.R. Co. operates 5.5 miles of road, owns 135 horses, 50 horse-cars and 20 cable-cars. Directors, R. F. Morrow, J. L. Schmitt, J. Naphthaly, F. J. Low, R. G. Byxbee, San Francisco, Cal -- R. F. Morrow, Pres., J. L. Schmitt, Vice-Pres., A. K. Stevens, Sec., M. Schmitt, Treas., Jas. McCord, Supt., R. Price, Mast. Tr. Rep., H. Willy, Mast. Car Rep.. -- GENERAL OFFICE, Fourth & Townsend Sts., San Francisco, Cal. Sutter Street R.R. Co. operates 5.5 miles of road, owns 185 horses, 50 horse-cars and 20 cable-cars. Directors, R. F. Morrow, J. L. Schmitt, J. Naphthaly, F. J. Low, R. G. Byxbee, San Francisco, Cal -- R. F. Morrow, Pres., J. L. Schmitt, Vice-Pres., A. K. Stevens, Sec., M. Schmitt, Treas., John McCord, Supt., R. Price, Mast. Tr. Rep., H. Willy, Mast. Car Rep.. -- GENERAL OFFICE, Polk & Sutter Sts., San Francisco, Cal. Black 1424. Sutter Street Ry. Co., Ofc., 77 Stevenson.